Ahh, those memories of Chef Daniel's Kitchen at Iluma. 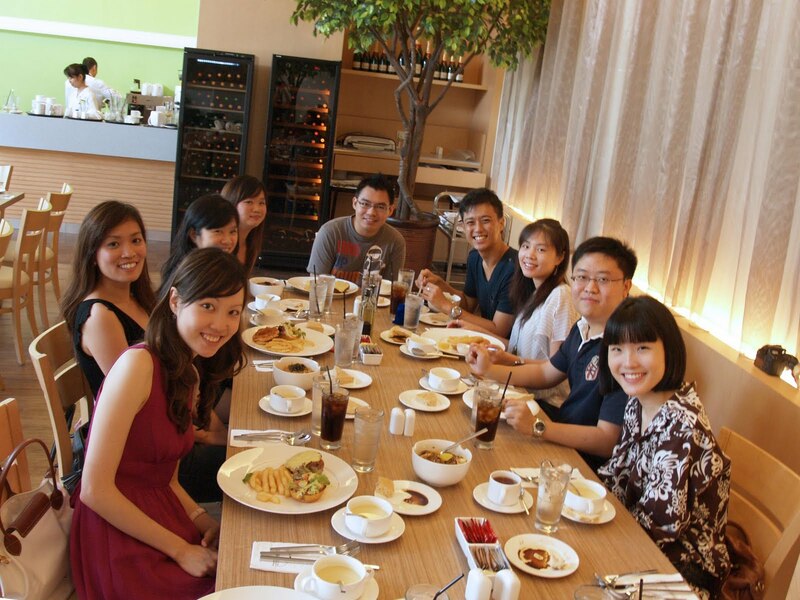 I miss my monthly blogger outings, I really do. Ever since I've started work, it's been close to impossible to find time to meet the rest, and already I'm watching a couple of outings slip by past me because I'm so occupied with work. For now, outings like this one I'm blogging today would serve as pleasant memories, and a small ray of hope perhaps, as I await the next food blogger outing. 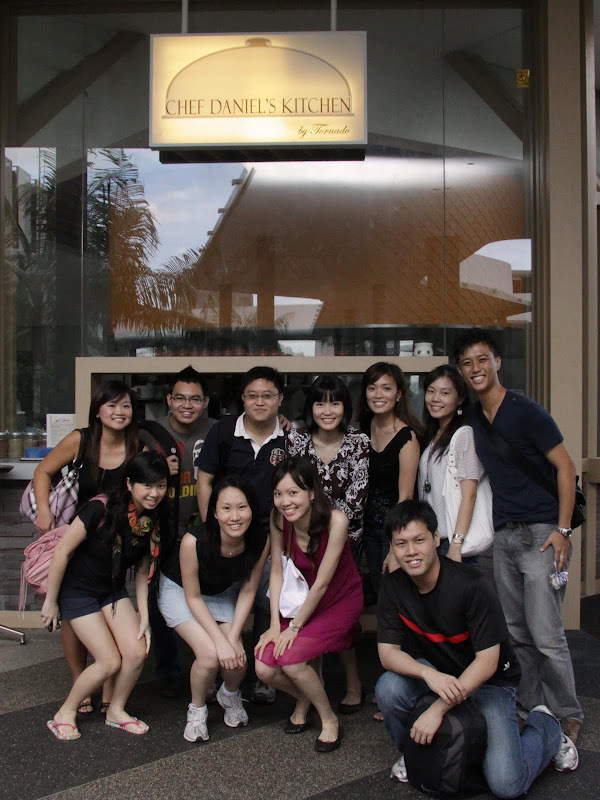 Sometime last month we organised a gathering at Chef Daniel's Kitchen at Iluma, which if you hadn't known is situated directly opposite Bugis Junction. It was a bittersweet kind of gathering actually, sweet because it was a meet-up after quite a while with fellow like-minded friends, bitter because it was a farewell lunch for Lorraine since she would be migrating to the Netherlands the following week. The venue for our outing was, coincidentally so, recommended by Daniel (no relations whatsoever to the Chef), and is a cosy, rooftop diner that is more popular than you would expect. Chef Daniel's Kitchen set lunch, which we all had, is affordably priced at $10.50nett and comes with a soup, a drink and a dessert. Let's roll out the food, shall we? Any diner that serves warm and soft focaccia bread gets a thumbs-up from me. Focaccia is definitely one of my most favourite breads out there. The soup-of-the-day, the Cream of Corn Soup wasn't very memorable and could have been better if it was a bit thicker. Almost everyone knew what I was going to order: Beef Grilled Burger. I probably have the reputation of being the biggest carnivore and burger fan amongst my food blogger peers, and I know next in line would have to be Phoebe for sure. I thought the beef burger was alright, though a tad small. The patty was a little too moist as well but nevertheless it was saved by the tangy tomato pickles that added some extra flavour to the burger. Read on to see what the rest ate! Lorraine liked her Tonkatsu Don, and remarked that she actually likes the tonkatsu here as compared to the one served at Tampopo because of the way it was breaded as well as how there weren't much (if any) fats to the cutlet. Charlene, who had the same dish as well, wrote that the tonkatsu "wasn't exactly very deep fried, and there was a hint of lemon in every slice", which she loved. Fen thought the Fish and Chips was average, but at least it wasn't too oily as some others are. Here's some others which I don't really know how they went, but still, something to feast your eyes on! This looked really good, and I'm sure it tasted quite good too! The dessert-of-the-day, the Raspberry Mousse Cake, was a sweet and simple dessert to wrap up the meal. While not mind-blowing, it was decent enough for me. $10.50nett for each set lunch, which includes a soup, a drink, a choice of main course, and a dessert. 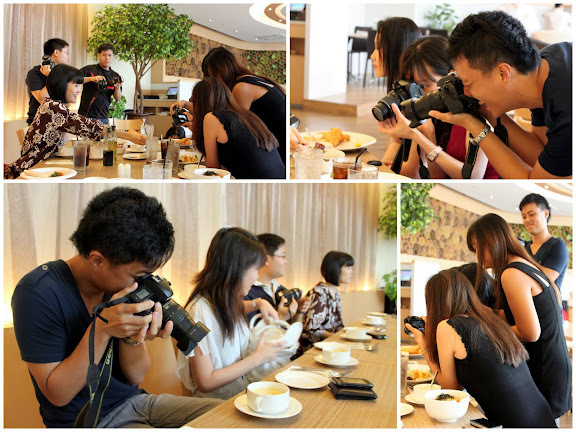 Thank you Fen and Yuan for the first two pictures on this post. Desserts. It's a bad habit, but how can you fault anyone who just love sweet endings? Dinner at Bonifacio was great and we were in the mood for something cool and refreshing to cap off our little meeting of three. There weren't many cafes or restaurants around that were open by the time we were done with our dinner, and so we decided to settle on something simple - Sugar Granny Cafe. My sinful indulgence for the night, and I enjoyed every spoonful of it. The paste was smooth and sufficiently thick without being sore-throat-inducing. I liked the way it warms me up inside, very nice and fuzzy. I initially wanted a cup of coffee, but this item on the menu caught my eye - Slim Chendol? How can chendol ever be non-fattening? Seeing that it was the perfect excuse to act ignorant and fall for the gimmick, I ordered it ha! Not surprisingly it turned out typically sweet and milky and there's no way this would have been any healthier than the not-so-slim chendol. Still, minus the health concerns, this makes for a good sweet treat. Xinli's choice of dessert - simple, fresh, smooth and refreshing. Nice. Lorraine's drink for the night. It's supposed to be a specialty but I guess it didn't quite live up to the hype. It's a passion-fruit drink with lots of nata de coco and aloe vera bits in it, though the plus point really is that you have fresh fruit pieces in the drink as well. I think Lorraine enjoyed it quite a bit. Very good, though slight language barrier with a couple of the waitresses. Near Outram Park NEL Station. 1. No GST and service charge. 2. No main courses on the menu. 3. Opening hours: Sun–Thu 1pm – 11pm, Fri–Sat 1pm – 1am. The first thing that I noticed, and with much excitement, was the wood-fired oven. Other than Spizza at Balmoral Plaza, here is one other place in Singapore where you can get really good wood-fired pizzas, fresh and crisp from the oven! Al Forno definitely scores full marks for its authentic and delicious pizza. The Pizza Costiera was a delightful treat with fresh seafood ingredients and tasty mozzarella cheese. Most importantly, the dough was perfect - thin in the centre, soft and fluffy on the sides, and crisp on the edges. Every bite transported me back to Italy. Gosh, I miss that place so, so much. The Lasagne was not bad, but it wasn't entirely good either. There was quite a monotonous feel to it after a couple of forkfuls, and this is not just because we were getting filled up on the pizza. It's been a very long time since I had it, but I think one of the better lasagne in Singapore can be found at Modesto's. Sadly, the Spaghetti Al Nero Di Seppia was worse. Ms Val, an avid fan of squid-ink pasta, gave it the thumbs-down for being overly dry and tasteless. I doubt the fresh seafood ingredients could save the dish at all. One thing worth remembering was how we laughed when I recalled a kid writing in his food blog that he finds it "very arousing to see [his] date blush when she realized there’s a black smudge off the corner of her mouth". The weird things that turn people on these days. Very good. Expect a longer waiting time for your pizzas in the evenings though, as many people do takeaways. Opening Hours: Lunch: 12 pm - 2 pm, Dinner: 6.30 pm – 10.30 pm. If some of you have been wondering about the lack of updates on this blog, it's really because I've been in the middle of a work trip in Hanoi and will only be back in Singapore by the 25th. The ASEAN Ministerial Meeting is taking place right here in Vietnam (as you might have already known from the news reports today) and it has been pretty interesting stuff so far. I haven't been taking pictures of the food I'm eating, I doubt I would have the time at all, but I'll see what I can do in the days to come. For starters, I think SIA's in-flight food is disappointing, especially if it's in contrast to Emirates'. Room service at Sofitel Plaza Hotel (on my own account, mind you) on the other hand has been quite good. Till then, take care all in Singapore. First-Class Honours and Recipient of the NUSS Medal of Outstanding Achievement. Happy moments are meant to be shared. While I cannot say that I was enormously thrilled about it all because I was just so caught up and stressed over my work, nevertheless this is something that I've earned and something that I should be proud of. I do hope it will inspire me to work hard and do well at where I am at now, especially since the pace here has been lightning quick and the learning curve terribly steep. Still, since it's only in the toughest of times that great men rise, I should learn to think positively and adapt fast. My achievements in school would not have been possible without the strong and loving support of my wonderful family. In many ways I am blessed to have such doting parents, and I'm very grateful for all that they've done for me. It is because of their love and care that has made me the man that I am today. Frigidarium is good, take my word for it. The gelato here is delicious, the texture is quite close to the original, and the wide variety of flavours is just so enticing. I really liked my order of Hazelnut and Sakura (first picture), especially since the latter is something new to me (I know some of you may have already tried Japan's Sakura ice-cream) and it tasted refreshingly good. The hazelnut admittedly paled in comparison and was overwhelmed by the Sakura flavour. The best friend meanwhile enjoyed her rich Dark Chocolate (above) quite a bit, but liked the Italian Pistachio even more. Three's not a crowd, not when you get to sample more flavours. In fact, we had a total of eight different scoops for the afternoon alone. Wei Jie decided to go all adult with his Malaga and alcohol-infused Bailey's, but I thought Lynette's Pineapple & Coconut and Passionfruit were a bit better because of the fresh and fruity taste. All-in-all, pretty good gelato, though I do hope that Frigidarium doesn't get carried away with producing too many new flavours and ending up with more ice-cream than gelato. 146 Market Street #01-40 Market Street Car Park. EwF by Everything with Fries at Orchard Central is the fast-food extension of the original Everything with Fries restaurant. It reminds me a lot of Orchard Cineleisure's Burger Bench & Bar actually, from the burger-dominated menu to the chalk-written display boards to the young, cheery and eager to please (female-only) staff. It's mostly burgers here, but of quite a variety that I'm not complaining really. In fact, it's burger joints like EwF and Burger Bench & Bar that give the mainstream fast-food chains a run for their money (because of the fresher burgers and unique sides) and is a refreshing change from all the terribly processed meat. With a name like "EwF Super Burger" you would think this is EwF's signature burger and definitely something that it worth a try on a first visit. It's compactly served in a small tray but the first thing anyone would notice perhaps is the size of the burger. It's a tad small and it definitely won't fill you up if eaten on its own. The Super Burger, packed with so much expectations. The meat patty was good, tender and nicely minced. I can't remember what exactly the "special homemade sauce" was made up of, but there's surely mayo and some salsa in it. I think. It's a simple burger, not what I would really call "super" because I would expect much, much more then. The highlight of EwF has to be its flavoured fries, or why else would it feature fries so prominently in its name? The Sour Cream and Onion fries was voted as the best flavoured fries on the table, but if you happen to like the childhood curry-flavoured Twisties snack, you would love the Curry fries here as well. Very good, pleasant and friendly. $11.90 for a burger, fries and drink. For those of you free/crazy/energised/passionate enough to watch the late night World Cup matches, here's something for you to chew on (literally so) if you hadn't known by now. 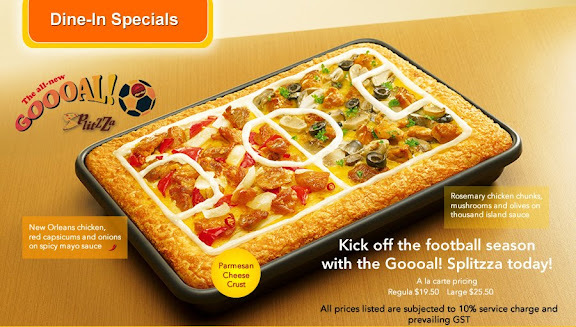 Pizza Hut's Goal Splitzza features the spicy mayo team on one end and the thousand island sauce team on the other, and on match days you can actually get this to be delivered to your home up till 3am (it's not free of course). Not many matches left by the time you are reading this, but here's an idea on what you can enjoy for the finals if you're cosying up at home rather than rubbing shoulders with the boisterous mob out there. My verdict? I was a bit disappointed with the aesthetics because I honestly wanted to see the mayo delineating the "pitch" on the pizza. That would have been quite adorable. On taste, I thought it was quite good actually, with adequate crisp edges, tender chicken pieces and distinct sauces. Granted that this is not exactly authentic Italian pizza, but for its "type" I think Pizza Hut still fares pretty well compared to its counterparts in the (mainstream) pizza business. Hungry? Order soon and eat it while watching the Uruguay vs Netherlands match! $19.50 for a regular, $25.50 for a large. As my Italy series comes to a close, here's one last post from the trip, featuring the food that I had on board Emirates. It's been a while since I've flown on a major carrier and I was naturally quite excited about what I'd be served. I know, for many of you it would be the in-flight entertainment that you'd be more concerned about, but I'm just ... greedy and hungry me I guess! You'd probably be seeing quite a bit of posts on "airline food" in future actually, since I'd be flying quite often in the course of my work. While it's almost always on SQ, there's always a chance for other airlines I'm sure. You can't ask for a fuller meal, what with coffee, soft drinks, wine and even chocolate bars accompanying this as well. It's decent enough food, and I especially liked the chocolate cake that was served as dessert (top left). Food served on board Emirates is Halal, so don't expect to find anything that contains pork or lard here. There's also a seafood menu that I found quite interesting and it's definitely something that I would be tempted to try in future. Nothing spectacular about the breaded fish fillet, but then it's still commendable given that this is served on an airplane. Again, I liked the dessert more: Tiramisu that was moist and creamy with a good mix of chocolate and coffee. Delightful indeed. And that sums up my Italy grad trip, which is very much illustrated by food, food, and more food! If you're interested to see pictures of the holiday itself you could always add me on Facebook, though do let me know you got the link from this blog, just so that I wouldn't think you're a spammer or something. 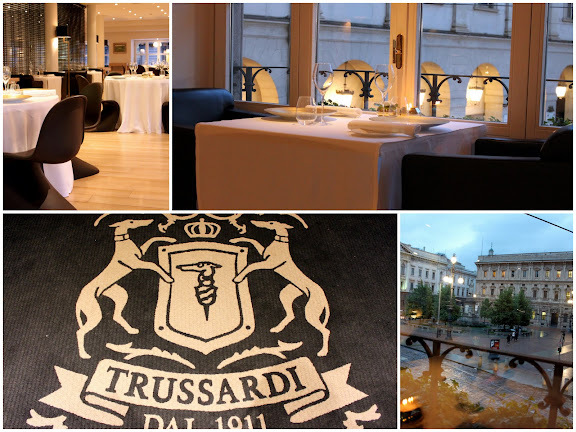 Il Ristorante Trussardi Alla Scala is the pride and joy of the Trussardi Group of fine dining and fashion, having been awarded two Michelin stars in the short span of just two consecutive years. There must be something special about this place that has sparked its inspiring rise towards culinary greatness, and it was only fitting that I find it out myself while living the high life in Milan. Il Ristorante Trussardi Alla Scala is helmed by the talented Chef Andrea Berton. While towering over his kitchen staff and me (and basically everyone else in the restaurant), his charming smile and affable personality was something that warmed up the atmosphere immediately. This is the "friendly giant" who seemed very delighted indeed to have some foreign company in his humble abode. Singapore of course is nothing exactly "foreign" to him, as he had only just returned from the World Gourmet Summit that was held in... Singapore. The setting here is modern and elegant, but also not over the top. I especially like the way the tables are spread out so much so that you get to have your own space and privacy to enjoy your food. I managed to get a table with a view of the Piazza Della Scala, and while it is nothing spectacular, it does has its own aura of serenity that completely sets you at ease. Perfect. In some ways this was like a dinner to celebrate. The trip had turned out really well and we were on to the final couple of days in dear Italy. What better way to wrap things up than with dinner at a Michelin-starred restaurant? Moreover it did not turn out to be as expensive as I thought it would be, and it was not even close to what I was spending splurging on the designer brands anyway. Money well spent, that's what I would say. We got the Blanc de Blancs Brut 1995 champagne to start us off for the night. I'm no wine or champagne expert but there's definitely a good balance to this Blanc de Blancs and it didn't come off as overpowering in any way. We delighted ourselves in the colourful Crackers as well, almost like surprised but happy children. The Seaweed Spaghetti with Anchovy is not something I would want to remember, but I still can and I still do. This was a cold appetiser that slid down my throat uncomfortably, and I have to admit I couldn't appreciate this as much as I probably should. Acquired taste perhaps, but it did leave a fishy aftertaste that got me reaching for more champagne. It's a good thing that the Breaded Cod Fish Breadstick that came after that was much more delicious. It's terribly simple no doubt, but the fresh breaded fish inside was really something quite special. This was a good add-on to the freshly baked and soft breads that were being served throughout the meal. The appetiser of Grilled Scallops, Ginger Marshmallow, Cream of Coral and Lime with Crispy Peanuts was very unique and in a league of its own. No one would have expected such a medley of well-seared scallops, ginger marshmallow and cream of lime to go so well together, but that's what makes Chef Berton so creative and talented indeed. I loved my main, I think it came straight from heaven. The Roast Breast and Braised Leg of Nantaise Duck was superbly divine, with such unrivaled tenderness that's almost unbelievable. I patiently savoured every single forkful of the duck and secretly wished the portion wasn't all that small. It's what some may call a little piece of heaven, and here I had three little ones all to myself. Hurriedly taken pictures cannot express even a hundredth of the happiness that I was feeling. On a choice between vegetables and potatoes, it's a definite no-brainer on what I would ask for. I wished I could have more of the lovely rosemary potatoes from Cafe Trussardi, but the Fried Patate came out quite delicious as well and it was not surprising that my limited generosity only went as far as offering the travel buddy a single piece out of this delightful lattice. Still, it was good to see the travel buddy enjoying his Black Cod with Saffron Sauce, Red Wine and Jerusalem Artichokes with such relish. He was full of compliments for the fresh and firm black cod, and insisted that I put it on record that it was "just amazing". So there you go. The mini-desserts thereafter just kept coming, compliments of the gracious chef. First up is the Passionfruit Cake and Ginger Sorbet in Earl Grey Reduction, which was small but flavourful beyond our expectations. The small tray of sweets was equally interesting, with ordinary gummies and peanuts placed beside absolutely heavenly White Chocolate Macarons and Italian Pistachios with Dark Chocolate. This was a personal favourite. Earl Grey Chocolates that would wow any chocolate lover with a wonderful combination of quality tea and milk chocolate. And, for something Asian, here's some Green Tea Walnuts for you to munch on. We're not done yet, because here's something really unique and special. 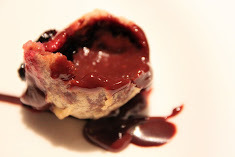 The Cosmopolitan on the Rocks brings shooters to a new level, as the popular alcoholic shooter comes on a bed of ice and is encased in a fragile chocolate shell. Put it in your mouth gently (and close it please!) and bite... The next few seconds would be quite indescribable. A rush to your head, that brief moment of euphoria, that momentary high... WOW. For all that creativity from the kitchen we thought it would only be right to order more. My dessert of White Meringue with Hazelnut Chocolate, Crispy Vanilla Bread and Rhubarb Ice Cream was nothing short of impressive. The hazelnut chocolate within the meringue was delicious, the crispy vanilla bread was sweet from the crisp layer of caramel, while the rhubarb ice cream was unique, light and tastefully sour. Lovely. The travel buddy's Creamy Tiramisu in a Glass was very unique too, and certainly not something you would expect of your typical and traditional Tiramisu. Not spectacular but still refreshingly different.